Following on from the exhibition ‘voci di pietra’ (voices of stone) at the Museo Civico Castel Ursino in Catania, the University of Catania has joined forces with the original collaborators in the exhibition (the Museo Civico, the Comune di Catania, the CNR-ISTC, the Liceo Artistico Statale “M.M. 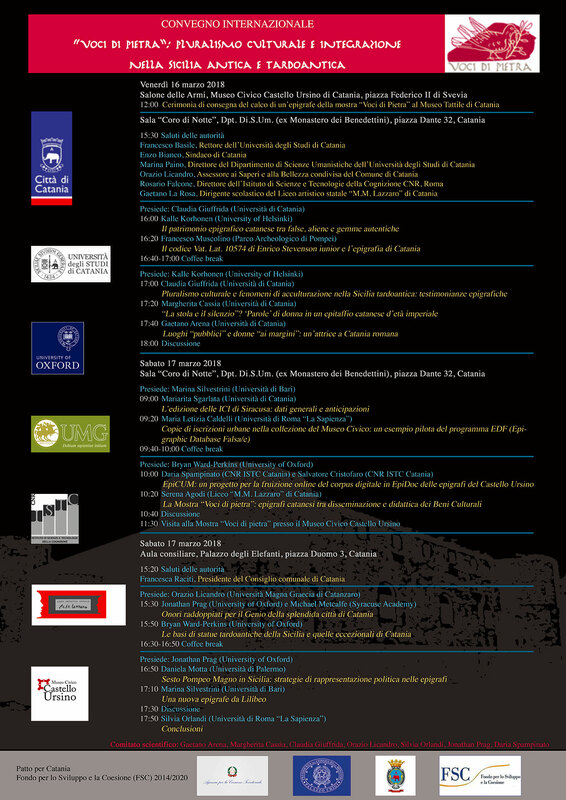 Lazzaro”, and the University of Oxford) to bring together leading scholars on the epigraphy of Catania and ancient Sicily for a 2-day conference. The conference will take place on 16 and 17 March 2018, in the University of Catania (ex Monastero dei Benedettini, Piazza Dante) and in the aula consiliare of the Palazzo degli Elefanti, Piazza Duomo.